Yesterday Famous Brands released their full-year numbers, showing that it has been a tough year. I watched the results presentation online, a first for them. I think all companies should offer that option, at the moment it is the exception and not the norm. As we already know, the GBK purchase has been a disaster, compounded by a weak Pound and strong Rand. Remember that the company suspended their dividend to make this purchase. In the results presentation they had a whole segment dedicated to GBK, which was very insightful. Management pointed out that between 2014 and 2017, the number of burger restaurants doubled. The market went from being undersupplied to being over saturated. Then to make things worse, Brexit happened, consumer confidence dropped, and discretionary spend slowed. GBK is a premium burger restaurant; expensive food was on the list of things where consumers spent less money. Management has found that when a competing store closes down, the GBK in the area sees a significant increase in sales. That shows how saturated the market is. Here is a slide from management showing how like-for-like sales have changed every three months. 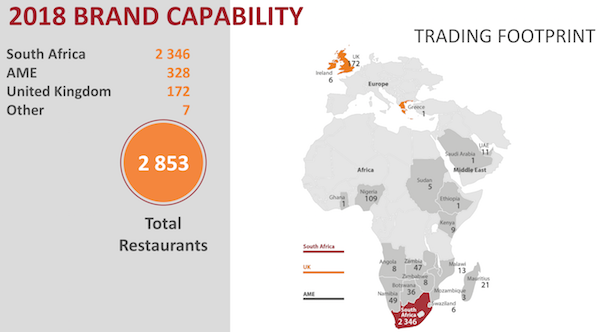 The bulk of the business is still in South Africa though (see store footprint below), and the lack of economic growth here has hurt them. They do point out though that the second half of the year was noticeably better than the first half of the year, which reflects the increasing consumer sentiment. Where to from here? If all goes according to plan, next year this time we will hopefully see the dividend reinstated. GBK still has some way to go before having a meaningful contribution to profitability, management has a plan they are working through, which should start showing fruit. The key for this company though is their brands, which when managed correctly create long-term value for shareholders. I think this stock will bumble around for the next 12-months, but after that the economic recovery in RSA should come through in the numbers, having a dividend and GBK improving its profitability, should see the market change its view of the stock.